Michigan’s in the taillights now. Wisconsin! Cheese! Green Bay Packers! Our planned first stop is a short hop to Ashland. 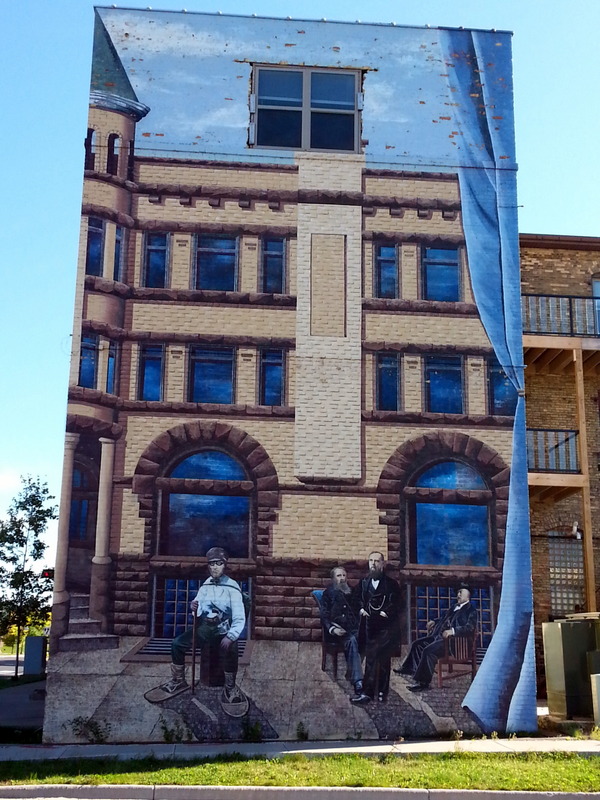 I’ve seen photos of the murals in this small town, and want to check them out. 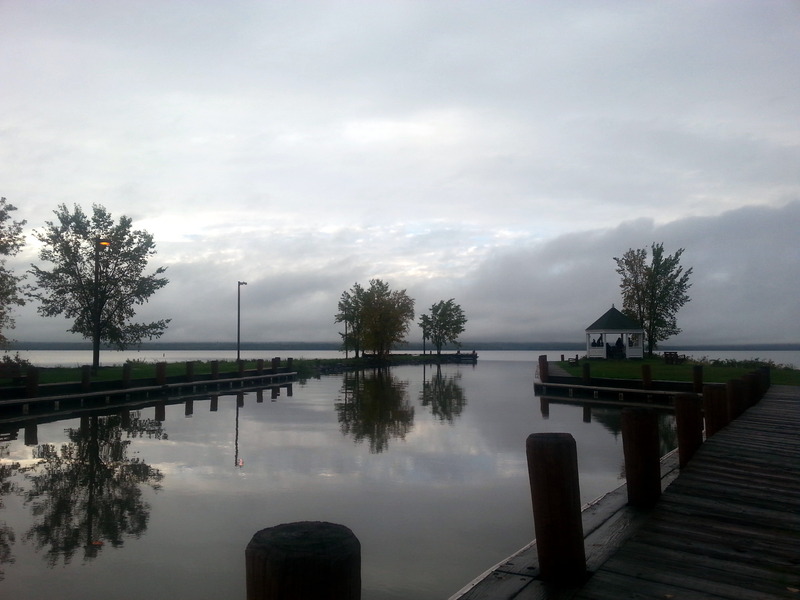 We find a municipal RV park, right on the shores of Lake Superior, and decide to stay for two nights. It’s windy, cold, and very dreary. 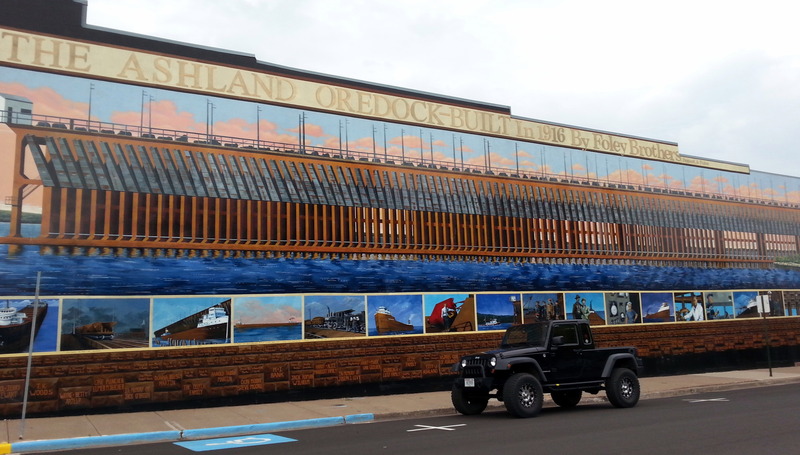 The dominant feature of the Ashland landscape is the Ore Dock, built over 100 years ago when Ashland was a main shipping point for the ore and timber extracted from the area. 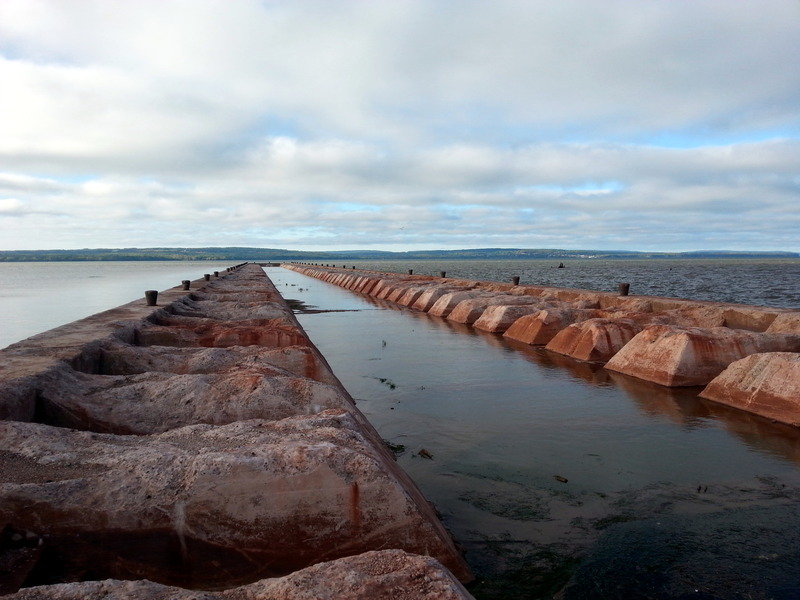 The ore dock extends nearly a half-mile into the Bay. The superstructure has been dismantled, leaving the dock base stretching out into the water. You can walk at least half-way out. Lake Superior laps at both sides of the huge metal dock. It’s cool. The other distinguishing feature of Ashland is the EPA shoreline cleanup site. 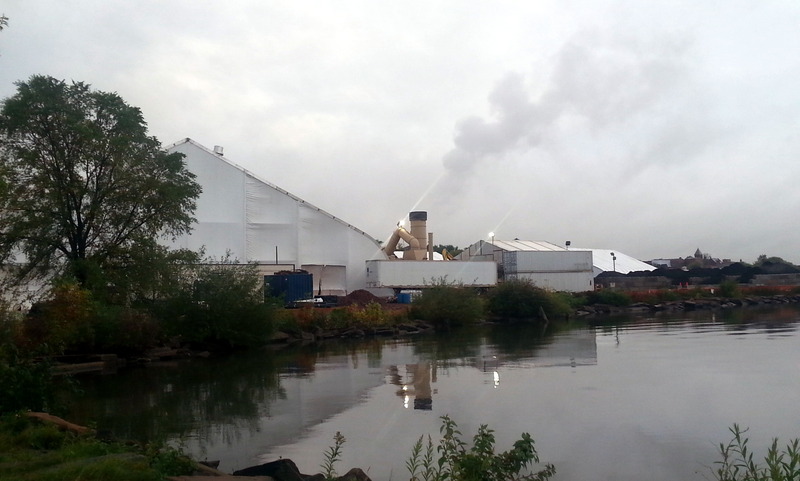 There’s the biggest tent you’ll ever see, complete with enormous air-handlers and smokestacks. Contaminated soil from the area is brought inside the tent by truck, and the debris is sorted. Soil is baked in an adjoining kiln, heated to 1200 degrees. After baking, it’s tested and redistributed. Non-treated debris is hauled off to some other site for disposal. The entire project is slated to take eight months, after which Ashland will have its harbor back. Our municipal campground is directly between these two spots. 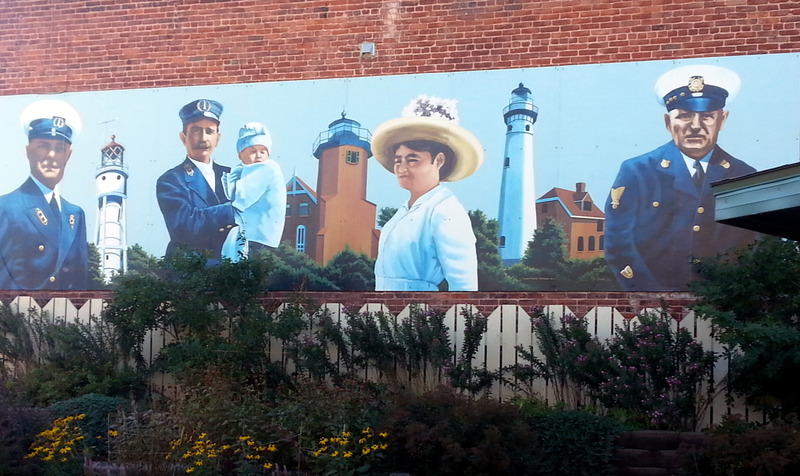 We establish camp, haul the bikes out of the Firetruck, and hit the road – armed with a brochure of the murals. Two mural artists have decorated the historic Main Street district of Ashland with murals depicting the history of the community the first in 1998, and the most recent in 2012. They’re glorious – colorful and informative. 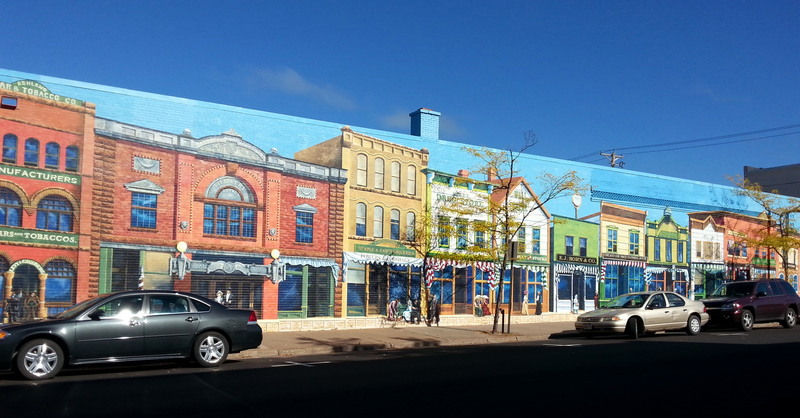 Some, painted directly on the brick buildings, are a block long. They are fabulous. 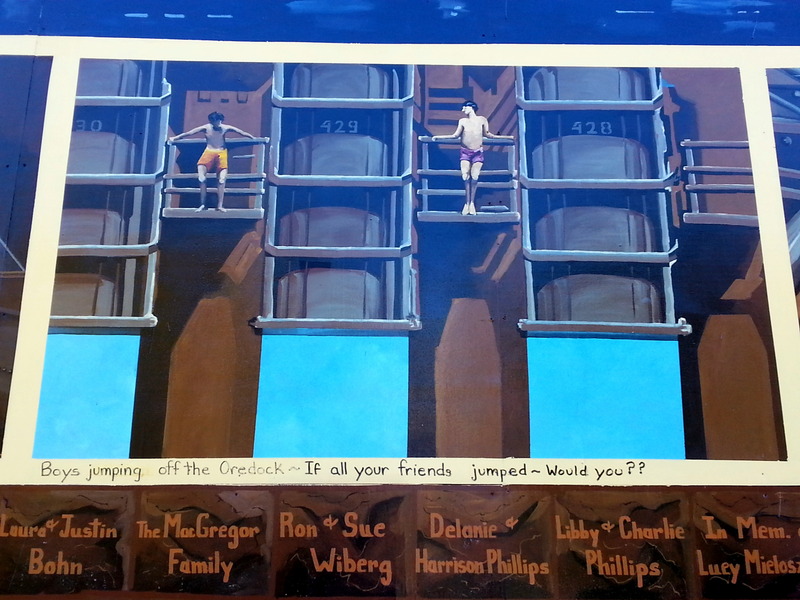 My favorite was probably the Ore Dock, which included many smaller portraits of its significance to the community. Even McDonald’s got into the act, and had a mural painted in their dining room. Hey, guess what? There’s a brewery in Ashland! South Shore Brewery. Beautiful setting. Beer….so so. Their claim to fame is their Brown Ale, which is not our favorite, but John enjoyed. I tried an Apple Ale – good at first, but it got pretty tiring by the bottom of the glass. John’s whitefish sandwich was good. My steak salad was ok. End of review. We spent a morning wandering around the city, grocery shopping by bicycle. There’s a wonderful food co-op here, and an old butcher shop with award winning brats. We stashed away a couple of frozen packages, hoping they will sustain us through the next leg of our trip. On my afternoon walk with Jezzy, we strolled to the ore dock. There, sitting on a piling about 50 yards from me sat a bald eagle. I had my binoculars along, so I just parked myself nearby and watched him watching me for about 10 minutes. I was hoping he would find himself something for dinner while I was watching, but no. We’re headed offshore – Apostle Islands. Taking a ferry to Big Bay State Park, where we’ll camp for three nights. The weather forecast is miserable. Oh well. It’s all about the adventure. This entry was posted in camping, great outdoors, retirement, simple camping and tagged camping, cycling, historic sites, Lake Superior, retirement, road trip, RV life, simple camping, T@DA, the great outdoors, Wisconsin by Judy Crankshaw. Bookmark the permalink. I don’t envy your weather, but I sure do admire all the beautiful, unusual things you are seeing! Guess we have to put up with one to get the other. Happy to do that. Actually, until the past few days, our weather has been great. Hope all is well with you and Ron. 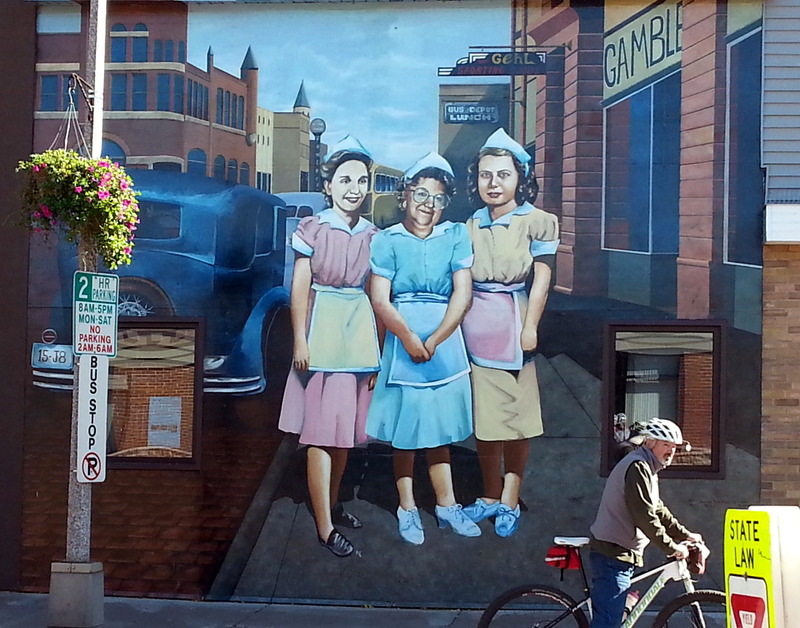 Loved the picture of John in front of the mural of three ladies. Looks like he belongs in the mural. LOL. The sky looks ominous in many of those pictures. Hope it clears soon. We’re getting the cold and rain and wind starting today and going through most of next week. Not a good forecast for Colorburst – high of 50 degrees, winds up to 37 mph, and 80% chance of rain. I’m going for the pancakes and soup and fire in the fireplace. Bet the gravel riders will have a great time. Ouch! Hate the Colorburst forecast. Hope it turns out to be false. Everything we own is damp. Feel like we’re never going to dry out. The Apostles are great! Too bad you’re having such bad weather. We’re hoping for a turnaround in the weather, but figure we’d rather go in bad weather than not go at all. Wish we knew how to kayak – looks like it would be a great place for that. Did you see an odd view of this post? It seems to have published itself last night, and reverted to an early version without photos. Since corrected, if you’re interested.